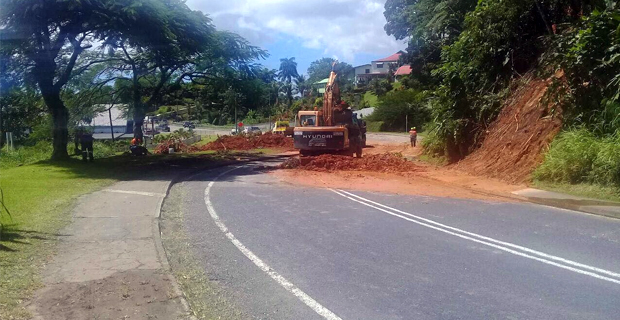 The Fiji Roads Authority is still clearing Princes Road close to Dilkusha where the major landslide had occurred yesterday. They are also trying to clear one lane of Princes Road where the two minor landslides had occurred. FRA cannot give the timeline as yet on when the road will be cleared however people have been told that the road will be open later today. Two vehicles that were passing along Dilkusha Road yesterday afternoon were pushed down to the bank of the Rewa River due to the major landslide. 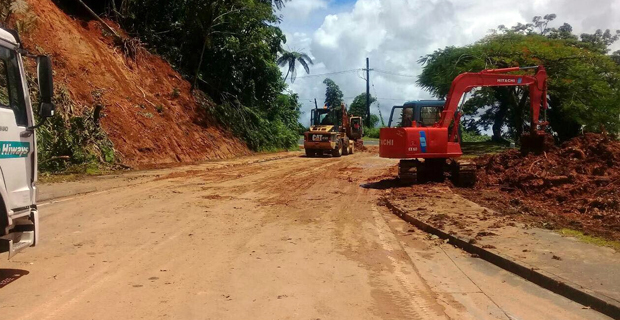 The heavy downpour in parts of Nasinu and Nausori yesterday led to drains being blocked causing roads to be flooded. Meanwhile a flood warning remains in force for the low lying areas and areas adjacent to and downstream of Naqali River. A flood warning is also in place for low lying areas and areas adjacent to and downstream of Vitogo Village. A flood alert remains in force for the low lying areas and areas adjacent to and downstream of Nausori Town. A flood alert is also in place for Ciri in Sigatoka. A trough of low pressure with cloud and rain lies slow moving over Fiji. It is expected to affect the group till tomorrow.